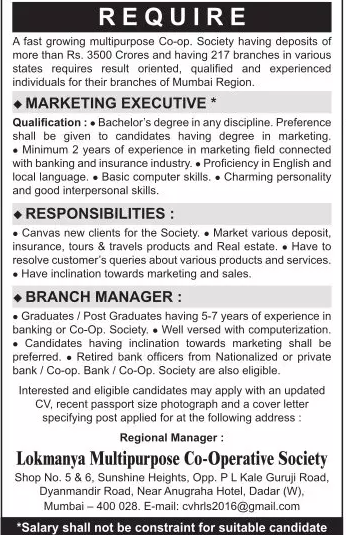 Lokmanya Multipurpose Mumbai (Lokmanya Multipurpose Co-Op Society), Mumbai Published Job Notification for Marketing Executive – Branch Manager & More Posts. Candidates who wish to apply must look at Lokmanya Multipurpose Mumbai Marketing Executive – Branch Manager & More Recruitment 2018. Eligible candidates can apply Offline before June 2018. Interested & Eligible candidates can send their application along with all the necessary documents and testimonials to Lokmanya Multipurpose Co-Op Society, Shop No.9, Sun Shine Heights,, Gyan Mandir Road, Off P.L.Kale Guruji Marg, DADAR (W), Mumbai, Maharashtra 400028. Starting Date, Last Date to Apply Offline at Lokmanya Multipurpose Co-Op Society which candidates should be remembers as follows.